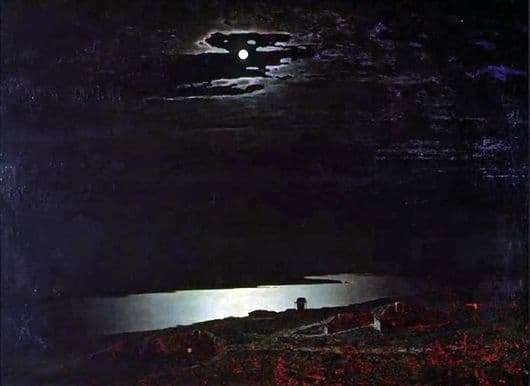 The picture is written by A. I. Kuindzhi and was exhibited by the only painting at the exhibition in 1880. The painting was the only one at the exhibition and became a real sensation. The artist himself said that this is the main product of his life. Kuindzhi all his talent focused on the transfer of the illusion of real light, and the search for a composition that will convey a sense of spaciousness and light. “Moonlight Night on the Dnieper” was the most convincing piece that conveyed the effect of lighting so real. The artist conveyed the moonlight and the light shining from the moon itself so precisely that the viewers who saw the picture were amazed. Harmony and tranquility, simplicity of the images in the picture. The artist for work chose the top point on top. From here he has the ability to display on the canvas to a greater extent the sky. Here the moon shines. She paints the clouds in cold light. Below you can see how the moonlight hovers on the waters of the Dnieper. One can see the slow flow of the river, its bends and the shoreline. Kuindzhi was called the artist of light. Such a title he received for his love of accurate light transmission of sunsets, midday shadows and moonlit nights. The water surface of the Dnieper, velvet night blue, illuminated by moonlight. Thanks to such lighting, the Ukrainian huts turn white. Despite the darkness, numerous objects can be discerned in the picture. These are the huts, and the trees covered with foliage, and the crooked stems of the thistle. All this is covered with night darkness, but is seen in brown color. The heavenly sphere is depicted by a majestic and endless artist. Creating a picture, Kuindzhi applied one artistic technique. He compared the warm reddish tint of the earth with the cold-silvery shades. This artist has achieved the effect of the depth of space. The feeling of vibrating light was due to the use of small dark strokes in illuminated places. The picture is in the State Tretyakov Gallery.